At the time of my visit, this week's bookshop was comparable to the book I bought there: initially a little grim, then packed with story, rounded off with a brilliantly optimistic conclusion. That may seem a little extreme, but it's pretty hard to feel happy when you arrive outside a bookshop to find a 'Shop To Let' sign. Which is exactly what happened as I crossed the road from last week's destination. The first sight is of a large area of recommendations that could easily house your average independent bookshop and leave room to spare. This was an excellent start and really helped build up the anticipation for the rest of my visit. 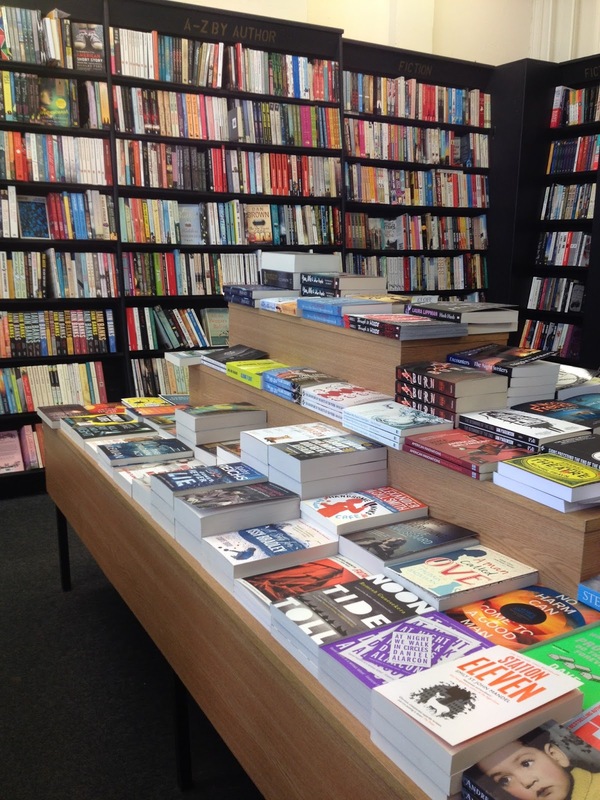 In this area, the shelves of fiction begin – continuing along the same wall to the back of the shop – and prompting a mix of excitement, only slightly tainted by the fear of that board outside. Where ordinarily I'd expect one or two titles by each author there was often at least one copy of every book they'd written, with a good number of complete works filling the shelves. I've commented before on my amazement at large, well-stocked independent bookshops, and here was no exception. Walking the length of the shop – through fiction, crime and sci fi – had me well and truly hooked, before I eventually tore myself away to look at non-fiction, classics and yet more recommendations, the only sour note creeping in when the occasional gaps on shelves forced me to contemplate the possible meaning of that To Let sign. That hint of an ending was a shadow hanging over the whole experience, and it was possibly the bleakness of my thoughts that drew me to selecting Station Eleven by Emily St John Mandel as my purchase. Thankfully, like the book, my visit finished with a sense of hope. I can't tell you the full ending for either, as one story would be a spoiler and the other simply hasn't reached its conclusion. What I can say is I discovered that this wonderfully well-stocked, huge haven to books isn't coming to the end of its life but simply downsizing by half the shop. Yes, this is sad news, but the important thing is that bookshop life goes on, and on, and on again, hopefully enabling me to return to find out how the story continues. Because who doesn't like a good sequel?